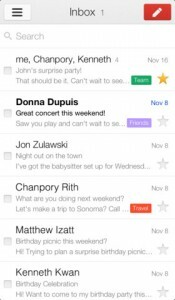 Home » What’s Your Favorite Gmail Client On The iPhone? 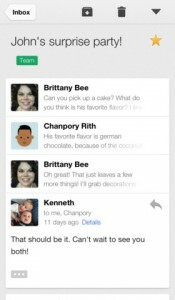 Google Gmail iPhone App Review. Probably there are a lot of you who don't have the Gmail app installed on your device. And why should you, when your iPhones and iPads came with a pre-installed Mail app, where you can check all your mails with one tap. I, for one, didn't even know Google had a mail app until today. But you know what? You should really give it a try. And even stick with it, especially if you only have Google mail accounts. The Gmail app is extremely similar to your regular Mail app. There's no surprise there. I liked the design a bit better, but basically it's the same. Same window, same buttons, but not necessarily in the same place you can find them with the regular email app. Basically, it's the same. But that's only at a first glance. The first difference between Gmail and Mail is clear: while one only supports your Gmail accounts, the other can hold all type of email addresses. This being one of the main reasons why most of use choose to use the Mail app, rather than Gmail. Plus, the Mail app comes preinstalled with the device, it works great, so why bother checking out something else? However, the differences that follow kind of put Gmail in a better light than Mail. The UI is better. And the user experience is greatly improved. For instance, instead of having all those buttons at the top right corner of the screen, you only get a couple of them, along with an elegant drop down button that reveals way more buttons, therefore way more options, than Mail does. It shows off what's needed instead of everything at once. Also, what I liked most about Gmail is that you have all you need in one place. With Mail, you always have to move back and forth if you want to check your Outbox, Drafts, and pretty much everything that isn't in your Inbox. With Gmail, you get all these folders with a single tap on the top left button. And the same stands for checking another Gmail account. A single window, with a single button that takes you anywhere you need to go, and do whatever you are looking to. However, at the end of the day, both Gmail and Mail have the same utility. The main difference is that, while Mail gives you more functionality, Gmail is more visually appealing. Gmail offers more options, it's easy to use, but that's just as far as your Gmail accounts are concerned. Mail might not have to offer everything that Gmail does, but what it has, it offers to all your email accounts. And I, for one, could never give up Mail. Even if Gmail looks more intuitive and easy to use, I find it exhausting to have a different mail app for every email provider. But, on the other hand, if I only had Gmail accounts, I would probably go with the Gmail app. 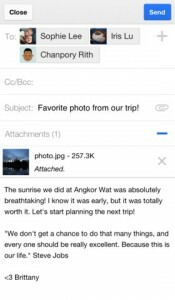 Either way, the Gmail app is worth the try. Even if just for the fun of it. Just last week, a new contender on the market was released. Mailbox.app aims to quote, unquote, put email in its place. Right now, it's free to download, but you'll have to wait in line to get a spot to actually use it. This is a smart move, although a bit inconvenient for users. After the Wunderlist 2 disaster that left users hanging for a couple of days because they couldn't scale properly (I switched from their solution after that, thank you very much), Mailbox.app and its reservations system seems fantastic to me. Mailbox.app is currently available just for Gmail accounts, but more will be added in time. 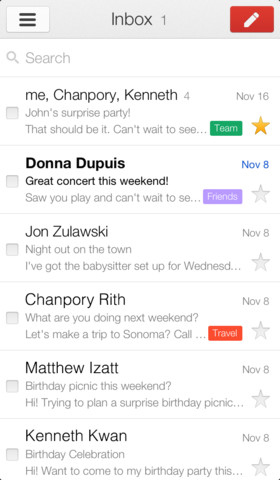 I have a feeling that Mailbox.app will surely replace the way I do email on my iPhone. 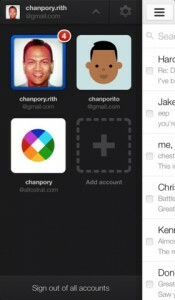 Check out Mailbox.app here. 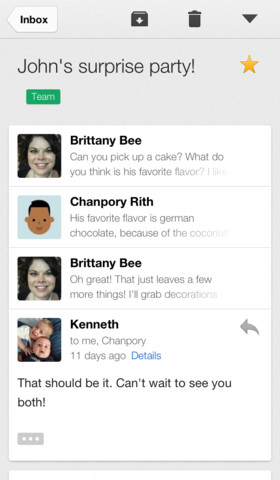 What do you think of Google Gmail? Scroll down for our comment section and let us know!